Book 8/25 in the 2011 Reading Challenge. Completed March 23, 2011. 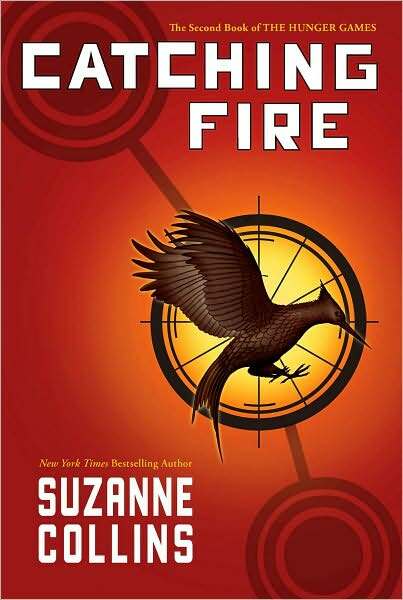 After reading The Hunger Games, I could not WAIT to dig into Catching Fire. It didn't disappoint. I won't say it was as good as The Hunger Games, but I still think it was good enough to be worthy of a five-star Goodreads rating. It was certainly more engaging than my average "four-star" read. Suzanne Collins has a way with the characters in this series. They almost all have weird names - Katniss, Peeta, Prim, Haymitch, Cinna... (The list goes on and on, actually.) But somehow they are still remarkably memorable and enjoyable. Catching Fire follows the story of Katniss Everdeen, the winner of the 74th Hunger Games tournament, who winds up faced with a whole lot of trouble as her fans are empowered by her brave example (though the full effect of her actions may not have been wholly intentional). Essentially, a desperate population clings to the hope that they are strong enough to overthrow the Capitol. And the enraged Capitol springs to action with the sole intention of making an example out of Katniss and everyone she holds dear. I don't want to get too far into the story line at the risk of completely spoiling it, but once this book... well, catches fire - it doesn't slow down. I read the last two thirds of the book over the span of two late nights and one morning. As I edged closer to the final pages, I was completely baffled at how it could POSSIBLY be coming to an end already. When I reached the end of Catching Fire, I was wide-eyed and wanting more! My Reader's battery was low, though, so I opted to charge it and start in on Mockingjay tonight after my kids go to bed. I'm pretty excited about it. This trilogy has my attention in a really super nerdy way. Never before have I been so involved in a series of books that I dream about it - I literally was dreaming up endings to this story the past couple of nights. I'm excited to see what sort of end Suzanne Collins dreamed up in Mockingjay, and I am very hopeful that the movies based on these books will not come as a total disappointment, the way that so many book to film conversions do. I am so glad to hear that you are liking the series. I hope that they do the movie justice but so far the cast a beach blond girl for Katniss. Which is so far from the character that I am worried that all the makeup and wigs are going to make it unbelievable. The first book was my all time favorite of the series because it held the most unexpected surprises in it.